Personal-injury claims often rely on an engineer to reconstruct the crash, a medical doctor to diagnose the injuries, and a biomechanical engineer (or biomechanist) to relate the injuries to the crash. In this article, we will describe the qualifications and role of a biomechanist and how a biomechanical analysis is conducted for cases involving head injuries and helmet use. We will explain how helmet certification requirements are applied to an injury analysis, what portions of the helmet must comply with the standards, and differences in head coverage across helmet models. We will also explain how medical records and helmet evidence are used to determine head impact location and how biomechanists reconstruct helmeted head impacts to estimate impact severity and injury risk. Who is the right expert? Following a car crash, a forensic analysis typically starts with a collision reconstruction. The reconstruction engineer relies on vehicle photographs, scene and vehicle inspections, Traffic Collision Reports, property damage estimates, event data recorders, calculations, and/or physics-based software to quantify the vehicle dynamics and collision severity. A medical doctor diagnoses and treats the plaintiff’s injuries, while a biomechanical engineer quantifies the forces applied to the plaintiff during the crash and determines if these forces exceed the tolerance of the injured tissues. Reconstruction engineers and medical doctors sometimes opine about injury causation, but often lack the necessary training and experience to properly support these opinions and potentially stray outside their areas of expertise. Biomechanists have formal training in engineering mechanics, anatomy, physiology, occupant loading, and tissue failure. Most biomechanists have an undergraduate engineering degree with a Masters or PhD in biomechanics, kinesiology, or biomedical engineering with a focus on injury or the failure of biological tissues. Biomechanists assess how different parts of the human body respond to applied loads, how stresses and strains develop in tissues during loading, how tissues fail, and how variability in the mechanical properties of biological tissue affect their response and failure. Their knowledge of anatomy and physiology allows them to understand medical diagnoses, different injury classification schemes, and how reflexes influence a tissue’s response to applied forces. This combination of engineering and medical knowledge is needed to properly assess the causal link between an injury and an event. Attorneys litigating motorcycle cases may be confronted with comparative liability if their client was not wearing a helmet or not wearing the right kind of helmet. In these cases, a biomechanical engineer can help answer questions related to helmet effectiveness: Was a helmet being worn (properly)? Was the helmet approved for the activity and did it meet certification standards? 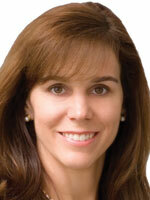 Would a helmet (or better helmet) have reduced the injuries sustained by the plaintiff? Though each case is unique, the analytical approach used to answer these questions is often similar. The biomechanist typically inspects the plaintiff’s helmet to document evidence of damage, extracts the diagnosed injuries from the plaintiff’s medical records, and relates both the damage and the injuries to the helmet’s head coverage and ability to attenuate the impact. This information is then combined with data from the scientific literature regarding injury tolerance and helmet effectiveness to answer these relevant questions. Helmets are tested and certified according to standards developed by various organizations. For example, the Consumer Protection Safety Commission (CPSC) regulates bicycle helmets, the Department of Transportation (DOT) regulates motorcycle helmets, and ASTM International regulates other sport-specific helmets such as skiing/snowboarding helmets. The standards that a helmet is certified to are indicated on interior labels for all helmets and also on the rear-exterior for motorcycle helmets. A biomechanical engineer can rely on a helmet’s certification requirements to answer questions about injury potential in a specific collision. One type of test, called the impact attenuation test, is common across all certification standards and quantifies a helmet’s ability to reduce head accelerations during an impact. 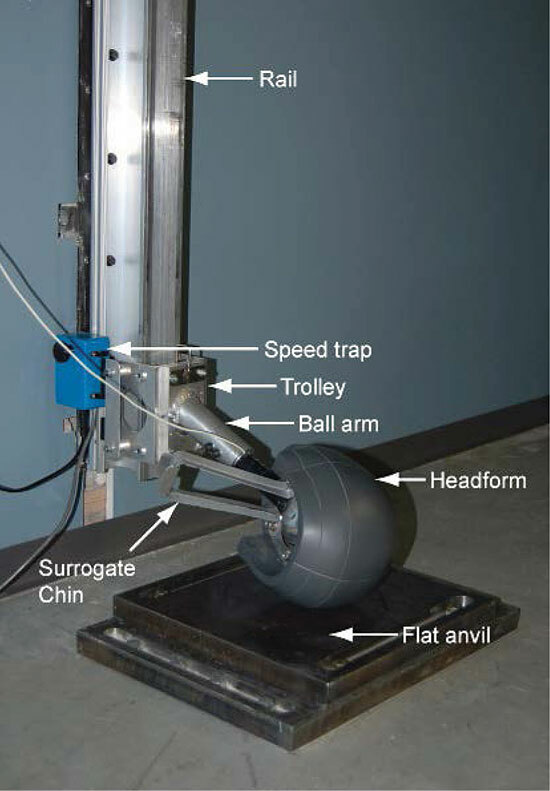 This test is done by placing a helmet on a metallic headform and impacting the helmeted headform at a prescribed speed onto an anvil, or impact surface, while recording the headform’s acceleration (Figure 1). The part of the helmet that attenuates head acceleration is the energy-absorbing liner, a foam layer typically made of expanded polystyrene (EPS) that crushes and cracks during impact and then partially rebounds after the impact. The crush that can be measured after an impact is referred to as residual crush. The liner protects the head by increasing the distance and duration over which the head decelerates and thereby decreases the peak acceleration experienced by the head. The liner crush also distributes the impact force over a larger area of the skull and thereby reduces the risk of skull fracture. A helmet’s impact attenuating capability is a key element of a biomechanical analysis comparing the effects of a certified and non-certified helmet. For example, consider a case where a vehicle and motorcycle collide and the motorcyclist, who was wearing a non-certified helmet (often called a beanie or novelty helmet), struck the roadway and sustained a skull fracture. A biomechanist can determine the head’s impact speed with the roadway, and then assess whether a certified helmet would have reduced the motorcyclist’s injuries. A non-certified helmet typically lacks an energy-absorbing liner or is fitted with an inadequate energy-absorbing liner. 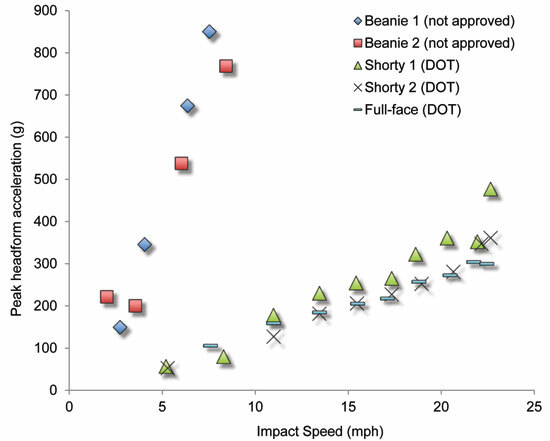 When impacted across a range of speeds, peak headform accelerations are much higher for a beanie helmet than for a certified helmet (Figure 2). Head impact speed when falling from a seated position on a motorcycle is about 13 mph. At this impact speed, a non-certified beanie helmet does not protect against a skull fracture while a certified helmet does. Although many real cases are more complicated, this simple example shows how a biomechanical analysis can be used to establish that the motorcyclist’s head injuries would likely have been prevented if he were wearing a certified helmet. The impact testing protocols in most helmet standards are similar for a wide range of helmets and applications; however, the pass/fail criteria may vary depending on the helmet application. The peak headform acceleration allowed for bicycle helmets is 300g, whereas the peak acceleration for motorcycle helmets is 400g under similar conditions. Also, impact tests are only done to a specific region of the helmet above a “test line” prescribed by the applicable standard. The test line is measured from features on the headform and sits relatively high on the forehead and well above the tops of the ears (Figure 3). The test line location varies slightly between standards, and portions of the helmet that extend below the test line are not required to attenuate impacts. This means that a certified helmet may not prevent an injury located below the test line. Other differences in certification testing exist across helmet types. For example, motorcycle helmets have a shell penetration test, during which a sharp striker is not allowed to penetrate through the shell and liner to contact the headform at a specific impact speed. Bicycle helmets do not have a similar penetration requirement. Standard specific requirements can affect a helmet’s ability to reduce or prevent a head injury, and a biomechanist can interpret these differences to assess injury potential for a specific case. Different helmets cover different amounts of the head. For example, shorty-style motorcycle helmets have the least coverage of all certified motorcycle helmets, whereas full-face have the most coverage (Figure 4). Bicycle helmet shape and coverage also vary widely. BMX-style helmets tend to be round and cover more of the head than traditional bicycle helmets, which typically sit higher on the head and have more vents (Figure 3). Most bicycle helmets, other than certain mountain bike and BMX helmets, also lack facial protection. 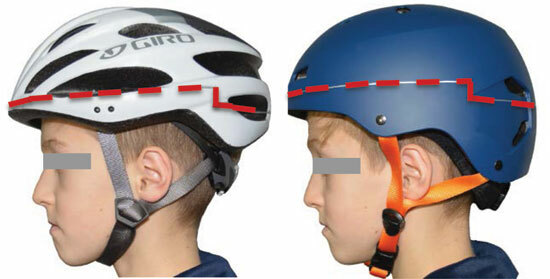 This varied coverage means that locations on the front, back and side of the head may not be covered by all helmets and may be exposed to direct impacts, even for certified helmets. Depending on the type of head injury, evidence of head contact may be documented in the medical records as superficial abrasions, lacerations, swelling, or fractures, while evidence of helmet contact is generally seen as exterior scrapes, abrasions, and compression or cracking of the foam liner. Computed tomography (CT) scans and magnetic resonance imaging (MRI) of the head reveal skull fractures, scalp swelling, and brain injuries. Evaluating the digital images can be an important step in a biomechanical analysis because swelling outside the skull may not be documented in the radiology report, yet this information can be valuable in establishing the head impact location. Some cases may also benefit from CT scanning the helmet to non-destructively locate and quantify liner residual crush. It can reveal concealed gaps or geometry changes between the foam liner and shell, and can be used to reconstruct the three-dimensional (3D) geometry for additional analyses. With 3D head and/or helmet reconstructions, the head contact location can be compared to the helmet damage and coverage to determine if they overlap and to assess a helmet’s effectiveness for specific head and brain injuries. Head motion during a helmeted impact is generally described as linear or rotational, or more typically a combination of both. Recent advances in our understanding of brain injury have indicated that head rotation is more important than linear motion for some types of brain injuries, particularly in concussion. Certification standards currently limit the allowable linear acceleration and only recently have rotational acceleration limits appeared in a minority of standards. Some newer helmet models include tethering systems or damping material between layers of foam designed to allow the helmet to rotate about the head during an impact. These design strategies attempt to reduce the rotation experienced by the head during an impact. These designs show promise in the laboratory, but their ability to reduce injuries in the field is still being evaluated. While helmets can potentially reduce both linear and rotational head kinematics, helmet manufacturers are not (currently) under an obligation to limit rotational kinematics for most applications. Biomechanical engineers rely on helmet damage, diagnosed injuries, collision reconstruction, witness statements, and deposition testimony to determine how head contact occurred during a specific crash. To estimate the head acceleration experienced by a bicyclist’s or motorcyclist’s head during an impact, a biomechanist may attempt to replicate helmet damage in a laboratory. The amount of residual liner crush in a case-specific helmet can be quantified by comparing it to an undamaged exemplar helmet either directly after removing the liner from the shell, or indirectly by CT scanning both the case-specific and exemplar helmets. The residual crush is then reproduced in an exemplar helmet in a series of impact tests. This process involves placing a new exemplar helmet on a headform and varying the impact speed and orientation until the helmet damage is satisfactorily replicated. The corresponding headform acceleration is then assumed to be the head acceleration of the bicyclist or motorcyclist. Recent research, however, indicates that this analysis method has considerable variability and that a single value (or even a narrow range) of estimated head accelerations using this method should be questioned. Furthermore, the relationship between head acceleration and residual crush may be inaccurate at low impact severities where there is little residual crush and at high impact severities where the liner foam bottoms out. As a result, not all helmet impacts can be fully reconstructed, although even limited results can be useful in some cases. Questions regarding injury causation, particularly related to head injuries and helmets, require a detailed analysis of the collision reconstruction, diagnosed injuries, and how helmets attenuate impacts under the specific conditions present in a specific case. Helmets can prevent many, but not all, brain and skull injuries. By examining a helmet, quantifying damage, reviewing medical records, estimating head acceleration during impact and comparing it to test and injury data, a biomechanical engineer can answer questions about liability and injury potential that can support or refute a causal link between an injury and a specific event. John Gardiner, PhD PE, is a Principal and Senior Biomechanical Engineer in the Orange County office of MEA Forensic Engineers and Scientists. He has a BS degree in Mechanical Engineering, a PhD in Bioengineering, and is licensed as a Professional Mechanical Engineer by the State of California. Dr. Gardiner is responsible for conducting investigations to assess injury mechanics in a variety of cases including automobile collisions, falls, sports injuries, assaults, and shootings. 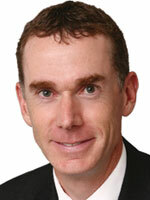 Dr. Gardiner is an active participant in MEA’s biomechanical research programs. He can be reached at john.gardiner@meaforensic.com.